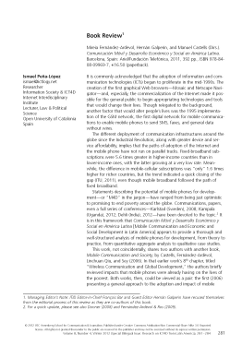 This issue features a piece written by me, the book review of Comunicación móvil y desarrollo económico y social en América Latina [Mobile communication and economic and social development in Latin America], by Mireia Fernández-Ardèvol, Hernán Galperin and Manuel Castells. As a bilingual issue, my book review has both been published in English and Spanish: please follow the links below to download the reviews. “Book review: Comunicación Móvil y Desarrollo Económico y Social en América Latina“. In Information Technologies & International Development, 8(4), 281-284. Cambridge: MIT Press. “Reseña de Libro: Comunicación Móvil y Desarrollo Económico y Social en América Latina“. En Information Technologies & International Development, 8(4), 285-289. Cambridge: MIT Press. Eva de Lera: What about social entrepreneurship? John Trexler: there does not seem to be a lot of activity in social entrepreneurship in the field of learning. Maybe other models, like free schools in the UK would be a better option if we are talking about education. Matthew Kam: it depends on the definition of social entrepreneurship. If entrepreneurship is doing something that benefits your community, we may find some. And some of this deliver pretty good education. Emma Kiselyova: Can we do more wrong than good? Jill Attewell: I’d rather use technology enhanced learning, not e-learning. This way, what we are doing is not creating something new from scratch, but enhancing something that already existed. Steve Vosloo: how carefully is too careful? Sometimes going “too” carefully may imply losing lots of opportunities. John Trexler: It is OK to go as quick as possible. The problem is that reflections need their own pace, and we sometimes take decisions on flawed reflections. Mireia Fernández-Ardèvol: What are the conflicts between formal and informal education? What is the role of motivation in this apparent dichotomy? Does it have to be informal to motivate? Is that good or bad? John Trexler: It depends on what we understand by motivation. Motivation has sometimes been “triggered” by just pouring money or free devices in the users’ hands. Mireia Fernández-Ardèvol: Indeed, motivation should come from other channels rather than — or added to — technological ones, like organizational change, institutions, etc. [I personally wonder whether we might be “crowding out” formal education for too much focusing in informal education]. César Córcoles: How do we know which projects are successful and which a failure? And which ones are more likely to succeed and which others to fail? What is the tolerance to failure? Matthew Kam: One of the problems is that most of the projects do not count as scholarly research, which means that many resources (especially human) are automatically kept away from being applied in many projects. On the other hand, most funding goes to successful projects, even if some failures may imply interesting lessons learnt that could be applied to following projects. Carlos Fernández: What about one-cellphone-for-all (the style of OLPC)? Manuel Castells: the matter is that almost everyone already has a mobile device, and thus is why many projects address mobile phones. John Traxler: this is the story again of the ideology behind the technology. Jill Attewell: people in poor areas want the same devices as everyone else and they want the same features. Julià Minguillón: the OLPC project failed because it never was an educational project. It never had the educational community in its design, teachers were not trained, contents were not created, etc. Ismael Peña-López: if industrialization — with its flaws — brought education to everyone, why do most educational projects keep on circumventing educational institutions instead of strengthening them? Why so much focus in informal education? Matthew Kam: agreed. Nevertheless, there are many aspects of informal education, gaming, etc. that could contribute a lot to improve and bring a wind of change to institutions [which I in turn agree too]. Manuel Castells: indeed, most schools are not about education and empowering the kids, but about politics. Nevertheless, if change is to be made, institutions definitely have to be an important part of it. Ismael Peña-López: Most projects here presented were about content-student interaction. Are there any projects that deal with person-to-person interaction? A: There are two ongoing projects in this line. One is called Speak Apps and it is about adapting the Tandem platform to the mobile world. The Tandem platform enables students in differents parts of the world to team up and study foreing languages, the languages being respectively foreign or their native ones. Another project is adapting the Langblog platform for mobiles.